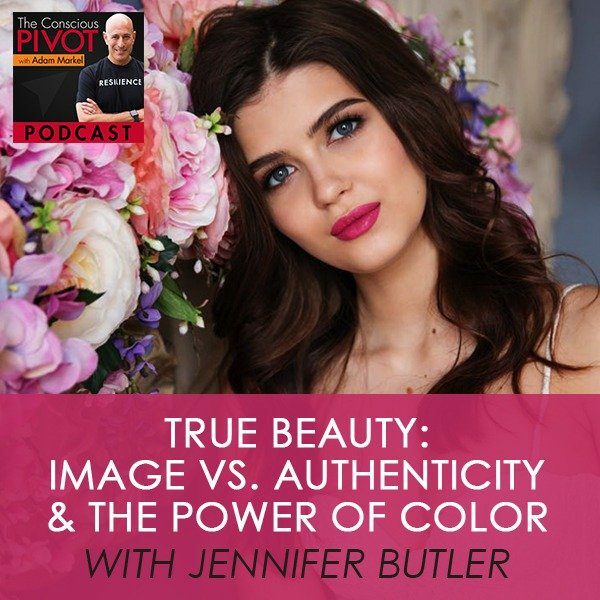 I’m excited to share with you another wonderful human that defines contribution and represents “True Beauty” – Jennifer Butler. Jennifer is as beautiful on the inside as she is on the outside. She has spent 35 years helping people live the lives they love through the use of color and the sacred geometry of design. She’s a true master of the Psychology of Color and Visual Communication. She has helped more than 7,000 individual clients fully express their authentic selves, applying the principles of Color and Design as a vehicle for Personal Growth. In this episode, Jennifer talks about how color, style, even the way our shirt collar falls, plays a role in our development and our betterment. It also highlights the importance of the visual to all of our communication. Jennifer’s is a truly heart-driven pivot that she shares – going from 10 years in the fashion world where image is everything, to the authenticity of inner and outer congruency and helping people better their lives. Through her work of letting go, developing self-trust, and finding where in her life she could make the biggest contribution, Jennifer became part of what she calls “the greater conversation of the universe, which is contribution and service”. She takes a soul-centered approach, believing that colors represent an intrinsic DNA map of yourself and that your presentation is a declaration of yourself. She helps people choose the colors and styles that best honor their own unique Sacred Geometry and create a powerful, authentic connection. Learn more about Jennifer and access incredible free resources about color, seasons, and the 7 Principles of Design at www.jenniferbutlercolor.com. It’s the first day that we’re recording the podcast in our new studio. It’s such a perfect opportunity and a segue to the individual that I get to share you with. I get to share her with you, who spent the last 35-plus years helping people to live lives they love by creating a very intentional process to use color in their life. Not just with what they dress but the colors in their home, the colors that are around them, the colors that bring them energy, that ground them, have them feel powerful, have them feel worthy. All the things that are going on in the inside where we have some insecurities or we feel lack or where we feel we’re not entirely on purpose, and where does color play a role in our betterment, in our development? It’s just magnificent. This incredible, beautiful woman has been helping people in that area because most of the communication is really not even verbal. It’s the things that we see and that we sense in other ways. I am so honored to have you with us here today. You’ve done something incredible. I always ask the person on the other end to introduce themselves because it’s just more fun that way. Would you be kind enough to introduce yourself in the most authentic way, meaning whatever comes up to you and however you feel and share anything at all about yourself, that would be magnificent? When I recall that moment, she was standing in front of a house that she designed for her six children and the door of the house was her eye color, the brick of the house was her skin tone and she had a romantic color, her beautiful shades of pink in the flowers. I probably was about six years old. At that moment, I had this experience of authenticity and then this dialogue of like, “It’s what’s inside that counts.”” What if the inside and the outside are the same? What if they’re aligned? What if the essence of what I’m experiencing of you is on the exterior of the body as well as the interior? That really started my life. I was trained at Bloomingdale’s. One day, a woman came up to me and she said, “I’d like you to help me with my personal style.” I said, “The coat department is over here.” She said, “No, you’re not hearing me. I want help with who I am and how I need to dress.” I realized, “I don’t know that answer.” That became my quest, “I’ve spent ten years in the fashion industry, why am I not learning about who I am?” I realized the answer wasn’t there. My life’s work came from living in an ashram with Muktananda in the early ‘80s. I had wanted to be married and we had decided three days before the wedding to cancel, but we still loved each other so I went to join him. I thought I was going to move in and he dropped me at the steps of this ashram, and so Muktananda was really the person, really the spiritual teacher. My roommate moved in and she said, “I’ve had my colors done.” I said, “What does that mean?” When she held them up, I realized I was experiencing who she was. It wasn’t just about what she was wearing or how she looked. I realized that the human essence lives in the way that we are created physically, like Mother Nature has thought of everything. There’s this master design to the universe that Mother Nature has given us and we’re part of that. I remember my teacher used to say, “We’re not thrown here by mistake. There’s this master design to the universe that Mother Nature has given us and we’re part of that.” As part of that, there’s a synchronicity to us, there’s an alignment, there’s a balance that directly comes from Mother Nature. I get to be her diplomat. Jennifer Butler, is it fair to say that you “found” yourself in Bloomingdale’s? I did. Isn’t that amazing? That’s a pretty funny tagline, “I found myself in Bloomingdale’s.” There would probably be a lot of men and women who would think that’s a pretty cool place to find yourself. Or the question to lead me to find myself and then the extreme of giving up all the fashion and living in this ashram, dropping all knowledge. When I interviewed with my teacher, I was very excited because she was an originator. When I walked in, I said, “I’ve been trained at Bloomingdale’s,” and I noticed that she was really quiet. She said to me, “That’s about image and I’m about authenticity.” That really, really struck me because I realized that she’s right. I was trained in image and how people should impress themselves and each other, not in who someone really was. The training for me is almost deconstructing myself and looking at the way that I was seeing myself and was I willing to be authentic? Was I willing to be real? Was I willing to be seen as a person? Or was I still caught up in not trusting myself? That’s a really important question when you have your colors done because I’m giving you the colors that are intrinsically your DNA map of yourself. It would take me six hours to paint the colors. I’m trained as a fine artist but my background is sociology and art history. Recently, I’ve been studying spiritual psychology at the University of Santa Monica. For me, it’s been a spiritual journey. What a great dichotomy the fact that you’re in a beautiful place like Bloomingdale’s or some other magnificent store. Was that Bloomingdale’s in New York? Yes, it was in New York. I’m a native New Yorker, living in San Diego and I wouldn’t live anywhere else at the moment. I think this is the most amazing place. At the same time, there’s nothing at all will ever be like New York. That’s a flagship store, that’s an iconic place. I was on a training with a group on Facebook of people that are wanting to build a business that they love. They want to be in a business they love versus being in a business that you do because it’s out of obligation, for example. A dear mutual friend of ours, Trina Watton, was on and she was commenting below about that. I think it landed it. It was pretty pointed for her that sometimes you’re in a business or doing something out of obligation versus it being more of a right livelihood and what does that look like. It sounds like you had a pivotal moment. I know you’ve read the book, Pivot. You even said to me that you enjoyed the book. I would love to get a sense from you of either what was that pivotal moment for you. I shouldn’t say that pivotal moment because we have pivotal moments all the time. There are some that stand out as being those moments were like with Robert Frost and the road less traveled, that place in a quiet wood where there are the two roads and you choose whichever one you choose. I don’t know that it’s romantic to choose the road less traveled by, and that’s why that poem resonates so deeply with people. Whatever road, whether you choose the road that’s more traveled or you choose the one that’s less traveled, you’ve got to choose the road that your heart wants to travel. That to me is the distinction. There is an obligation attached to it. Your pivot was very much a heart-driven experience or a spiritual path of sort. Would you share something about your pivot along the way? I remember you talked about being a lawyer. My experience was in retail and I love fashion and I loved all the shows and the glamour of it. I thought that’s what was going to make me happy. I did that for ten years and then at the end of it said, “Is this all there is? 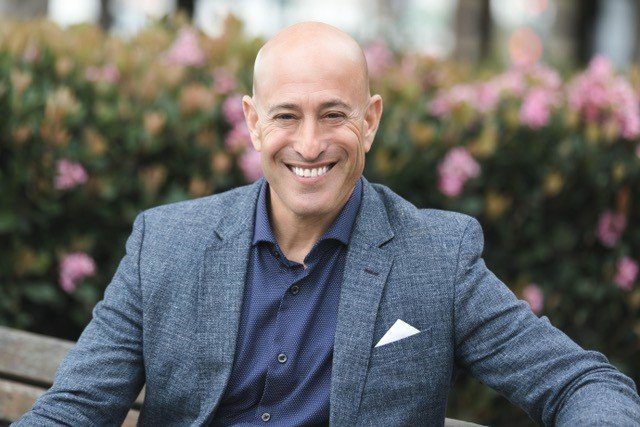 Am I living my life’s purpose?” I would say The Hunger Project, the training that I did was a pivotal moment because it was asking not just what I like and what I do well, but what do I want to contribute to the planet. That was pivotal for me, that training. That I took in 1978, so I was primed to leave the fashion industry because I realized I was not living my life of contribution. I would say after that Hunger Project event is when I went to train to do the colors. That would have been the pivotal moment. I think I asked the question of, “If I’m born with an innate purpose, what is the way that I can give the biggest contribution to the planet if that’s really why I’m here?” It had to speak for me from the inside. For me, it was a very heartfelt question. I was being purposeful, but where could I make the biggest contribution? That’s what shifted. It shifted from an inner self-accomplishment and proving myself, to letting go of the ego piece and listening to the greater conversation of the universe. To me, that greater conversation is contribution and service. It is a letting-go of proving and letting go of ego. When I started doing the colors, I didn’t have a color system. I have over 4,000 colors. Here I am letting go of everything, I let go of all my jobs. I was doing personal shopping and then someone in the ashram wanted their colors done. What I did was I painted everything and then I went to shop for fabrics. That started and now it’s over 4,000 colors, but it started at zero. Again, it was just that thing where I know that I can trust because I felt from a very deep place inside me that the universe was taking care of me. Is your sense of self-trust one of because the universe is taking care of you or is it because that you yourself are a trustworthy being? Yes, the spirit has always been a really important part of my life. My parents, we belong to many churches but it was all about the community and the fellowship. It wasn’t about any kind of religious dogma, so I’ve always had a really good relationship with religion. Whenever I traveled, I would go to all the churches and give a blessing. I feel very divinely guided by the angels and the Blessed Mother. That’s been a very important part. In 1968, I went to India. I was there with the Experiment in International Living. That would be another important piece. I was living with an Indian family and I wanted to be this ambassador of the country and become part of the community. That was interesting because in India, they want to know about you as a United States citizen. I was trying to become one of them and they wanted to know more about me and my role in the United States. I loved living with the family and it just taught me about the universality of everything. We would go to a community event in India and then they would want us to sing an American song. Remember the song from King and I, Getting to Know You? They loved us representing our own community. They wanted to know why people were living together and what was happening with our culture and they loved Kennedy at the time. It was a good time of very good relations and mutual admiration. To me, it’s a very feminine country and every time you turn around, it’s of spirit. In fact, I’m wearing an outfit from India right now. When you say it’s a feminine country, I’m curious about that. I remember you were sharing a little bit about the colors you’re wearing and why you’re wearing them and I want folks to hear that. In India, because there are so many people, you have to have an allowing of space. Because I was there in 1968, it wasn’t cleaned up in any shape or form. It was in more of this raw form. You had to have compassion for people because they were all around you, they had nothing. You had to create community instantly because it was so crowded. There was more of a softening, allowing, a sense of forgiveness, a sense of compassion is what I came home with. Because we went to a lot of spiritual gatherings, maybe it’s because of what I was drawn to and I got to hear Indira Gandhi speak, so for me it was all about peace, interrelatedness, international understanding, worldwide community. That was instilled in me in a very crucial time in my life. How did that inform the decision that you ultimately made to work with colors in the way that you do to help people transform not just their outer environment but really their inner environment? It sounds very much like that’s the environment that you work in more than anything else. It’s not how they look, it’s the sacred geometry of their design and it’s their innate inner energy. To see through someone’s disguise, let’s say, that’s my work and it’s always very humbling because I can’t make up that you look like somebody else because then I’m not seeing you. It’s this moment of always going inside, always being in the moment with the person and myself. The human pigment is this earthly record of our human experience. I wouldn’t see you without the pigment of your skin, the pigment of your eyebrows, the pigment of your eyes that creates you in physical form. If spirit lives there, then I’m experiencing an energetic exchange and that’s how I’m doing a palette. It’s a surrendering. The surrender is you surrendering judgment? What is it that you are surrendering? Yes, definitely judgment. I think in Spiritual Psychology, that’s what we looked a lot at is that essence lives in unconditional loving. If I’m holding judgment in some way, if I say to you, “I don’t really like my skin tone. I want a pink skin,” and my skin is peach, my skin tone is my self-love. Right there, I’ve tried to detach myself from who I am. The reason the work is important is you really come to terms with honoring your own creation and realizing that your physical design is one with your essence and that’s one with why you’re on the planet. You’re physically designed to do your work as a teacher. The psychology of color, what we are talking about is that I’m wearing my support color. When I do a color palette, there’s this whole range of colors that we give you. The support color is the color I wear to be there for other people. I’m wearing my eye color, the gold, which is the mirror of the soul and balancing in nature. For you, as a trainer, you’ll say, “What is my basic intention on the first day of this training? Is it to have people feel comfortable? Is it to have people feel challenged? Am I balancing the room?” Then, it might be your eye color. At some point, it might be your power color because you’ll have a really important message to get across and you want to have that sense of authority in the room. That’s a power color. There’s a whole range we give you to get your message across. Describe a little bit what that process is like, how it is that you create that palette for people. First of all, I’m trained to paint it. When you paint something, you get to the very core combination of colors that create the skin tone. Let’s say your eyes are in the golden brown family and you say to me, “My skin is olive,” part of olive is combining gold with purple and then your skin tone shows up. I have a whole class that Trina just did that’s about painting your own skin tone and then going to the museum and recognizing it and then practicing it in what you wear. Every day we get dressed and have an intention in the world. We were talking about the walls of your office, to me, I’m seeing an orangey-amber color, so the intention is from the root chakra, which is power, and the amber tone of it is knowledge. Power and knowledge is what you’ve created as the baseline of your training with your staff and whoever you bring into that office. I think a lot of when you have to pivot, there is that certain alignment but there’s a certain motivation. There’s a certain power that has to come from within a very base part of you to get you motivated and to be willing to make that shift. You’re shifting emotionally, I’m shifting psychologically but it definitely is a pivot and I feel the reason your book is so timely for me is that I’m making a new shift. Because I work with people privately, but now how do I get this message out internationally? I have people right now who fly from all over the world to see me. We have now teaching modules that we have created for people. This is a template that I followed to teach people. A lot of people understand by contrast. If I say to you, “Here’s your skin tone and here’s a skin tone that’s too dull. Here’s your skin tone, here’s a skin tone that’s too bright.” Then what happens is the mind and the body and the visual attunement catch on, but they catch on through contrast. The before and after, they’re so powerful. You spoke earlier about something that’s really important to me personally but the most important thing that I want to teach or to help people with. The core for me is self-love. What can you say about colors and self-love and how the work that you do with people helps them to experience some greater understanding of self-love? Image vs. Authenticity: That sense of self-love that you’re going to wear your skin tone to love yourself. That you’re going to wear your passion color to celebrate life. I think it’s fundamentally what happens out of the work. One thing we have to look at is the mind is constantly stimulated. After you get yourself together for the few minutes in the morning, then you’re open to all the stimulations outside of you. Particularly in this country with the media and the internet, there’s such a strong stimulus, so there’s a strong pull to go outside ourselves for the answer. You and I know that the answer is never outside ourselves, it’s always within. That’s fundamental to this work is that sense of self-love that you’re going to wear your skin tone to love yourself. That you’re going to wear your passion color to celebrate life. That you’re going to wear your basic neutrals that are the foundation of who you are. It’s a turnabout because the world lives by being attracted to its opposite. It lives in that polarity. Given that polarity, I have to bring myself home. When I had my colors done, I thought, “Why didn’t I figure this out? I had ten years in the fashion industry, had all this opportunity. If anybody, I should have been the one who had gotten it.” When I looked at my closet, there was my whole family’s colors in there and all of my friends’, there was none of me. Were those the opposites? Is that what that was? Yeah, they were the opposite and that was my physical proof. When someone says there’s a closet full of clothes and nothing to wear, there probably isn’t because we bought that, we bought into the attraction. We bought into, “It’s better over here, opposite of me, than it is to myself.” There’s this core self-trust that has to show up, a commitment to yourself to do my work because I’m going to give you yourself. Then there’s this gap like, “You gave me green. I don’t really like green. That’s my eye color.” Green is the power of money and green is your power of negotiation, so there’s this shift in your self-talk that has to happen. Number one, I’m committed to myself first, that’s what I had to say. I have to be my own home base. I have to come home to myself. I have to arrive at my own door, looking in my own mirror and smile at my own self, welcome myself to myself. When I make that choice as a fundamental choice to be who I am, as a fundamental choice to be self-nurturing and self-loving, then I’m okay exactly as I am. I don’t need to prove anything. I don’t need to be anybody else. All of a sudden then saying, “I really love my purple. I really feel good in this color. I feel like I can settle down. I feel I can be there for others.” A new conversation begins. The purple isn’t a color that you’re attracted to as you’re wearing it, it’s a color that’s you and so it’s not a polarity. What’s the opposite of that? What would be the word to describe how you would describe it not being polarity? Is it truth? Yeah, a truth, authenticity, I would say. I’m committed to my own authenticity and I really trust how I’ve been created. The universe didn’t stop at my door and say, “Everybody’s going to be beautiful but you, Jennifer, I’m so sorry.” I drew the bad card or something and that’s not true. When we say it, it’s a funny statement to even make about ourselves. If I know that the universe created me with divine inspiration, then what does that really look like? It’s this inquiry. It’s like this fun game that I can play. Within that, I can be all these different parts of myself. I can be on my first date wearing my skin tone. I can be on stage wearing my power color. I can be with someone I love and celebrate their birthday in my shade of red. It’s all about wearing my own coloring to celebrate who I am and then celebrate the world around me. That’s what I love that dressing with intention because I’m saying, “How do I need to be today on screen with you?” I want to be supportive and I really want to wear something that represents either my hair color, which would be like silver jewelry with purple, but my eye color is related more to your eye color. When I saw your picture, I said, “What would be relatable to you?” Isn’t that fun? It’s a whole new language of being, realizing that color is an access to being who you are. It’s the intentionality that’s among the things that are so powerful. I want to say something else about my life’s work because I grew up with five brothers and I’m the only girl. Three brothers are older and two are younger, so I was definitely the harmonizer. I didn’t really think of myself as, “I’m going to be out in the world. I’m going to be a presenter. I’m going to really own my power.” It was the opposite of that. When I had my colors done and I was told I was a winter, I thought, “That’s not really good news. That’s really being out there. It’s high profile. It’s being the hero is a man. It’s being the heroine is a woman and the priestess and really powerful in my own right and dressing in these vivid colors.” I had to come to terms with that. Once I did, it then helped me inform my gift because I wasn’t trying to hide out in any other place. You described it as a season as well, which you haven’t said so far. Would you share a little bit about where the seasons come into play? I’d like to share the inner light because that’s my love story about Mother Nature. She’s given us this love story and it’s like a fairytale. In spring, the spring archetype exudes the sunlight. The sunlight archetype is really our country on a good day. We’re the cheerleaders of the universe. We’re the youth culture. We’re really about inspiration and upliftment and the simple solution. It’s a process of renewal. We move to Mother Nature moves to her sustaining energy, and that’s summer. That’s people who are lit within by their twilight energy. It’s an inner light that comes alive when you’re wearing your coloring. That’s the agreement you have with the universe. I have to wear my coloring and then you’re lit from within. The twilight is all about softness, receiving. The intensity of the heat fades the color. It’s almost like the English mist, the fairytale of the gentleman and the princess and the lady. It’s really true. It’s really alive in us. After we have the sustaining energy, we move to the harvest of autumn. The autumn is lit from within from the firelight to get that fire going to have the crops harvested. It’s an energy of harvest and abundance and leadership and manifestation and appreciation and thanksgiving. I think you might be the same as me where we appreciate mastery. I was there learning that nobody else cares about perfection except us, one of our life lessons. The winter man is the hero and the winter woman is the priestess. We are lit by the moon. We’re the inner mystics. We have this power of really looking within ourselves. We’re naturally in a more meditative state. That’s why meditation every day is so important for us because we go to that stillness within where our power resides, where everybody’s power resides. It’s a very strong conversation because the moon is at a distance from the Earth. It’s this advisor but at a distance carrying the big vision. That’s the story. We have this creation of spring, the sunlight, the sustaining energy of summer, the twilight, the manifesting of autumn and abundance in the fire and then the moon, the inner moonlight. When you reside in your zone, in your archetype, in your tribe and it’s my rite of passage, then I’m all seasons. In the human experience, you could relate to everything I said but my rite of passage and really what I’m in charge of on the planet is the moon energy. That’s what I need to own in order to be authentic. Residing in your zone, that’s your zone of greatness. That’s the zone of authenticity. We’re teachers in every season but it’s like if I try to be the spring template, it wouldn’t be authentic. What’s interesting in my family dynamic is that’s how I was raised. My mother lives in heaven now, looking down at us, Ms. Maxine, and she’s a spring. I was trained by somebody to be somebody that I wasn’t because we always pattern ourselves, the men after our father and the women after our mother. The colors was so important to bring me home to myself. There’s lots of psychology in this work as well. You were summarizing, the winter is? The winter archetype, we call the men the hero and the women the priestess, the love of perfection. The love of mastery, it’s like the master teachers are winters. We look at the bigger view. In the New Year, what did we learn this year and how do we want to be in the next year? That’s on our watch, is who do we want to be in the world? I’m just curious, how much does the time of year that you’re born, the astrological component play a role? My dad studies the 9 Star Ki. There are so many different ways to look at when you’re born. How much does that play a role in those seasons? I feel like there’s a bigger part of the astrology that I don’t know yet that connects us to our season. I don’t think it’s the main one. I’ve asked that through the years. I wanted to know the astrology because I know it relates in some way but we haven’t discovered the tie-in yet. I appreciate it’s all a pattern. Astrology is a pattern of the stars and how they inform energy and so is Mother Nature. I feel we’re very aligned but I don’t know the dynamic of that yet. The clothing that we wear, how we clothe ourselves, that’s your primary work, right? Yes. It’s the clothing we wear but also I do a lot of interiors and wardrobing and shopping for people. It’s telling the whole story so someone leaves fully empowered. The color is fundamental, that’s the first thing. From there, we work on the design, the sacred geometry of the design. I want to show something because we can see it. If you look at the length of your face, where you have your shirt unbuttoned, if you go from the shoulder where your neckline is to where your shirt is unbuttoned, that’s about your head length. That’s what we call mirroring. The geometry of the work takes the sacred geometry of how your face is designed and your features, and you learn how to repeat it. For the guys, your jaw line for example, shapes the shirt collar you have on. The jaw line comes and then we repeat it right where the neck meets the shoulder on down. You can see the points of your collar could be a little lower. Image vs. Authenticity: Your dressing, in a way, is a contribution to others. What happens is what we call congruency. When you’re aligned with yourself, you offer me that alignment. Your dressing, in a way, is a contribution to others. If I’m missing myself then you’re trying to figure me out and then you’re trying to say, “Is this woman for real? Is this guy for real? Is what he has to say knowledgeable? Is it truthful?” You can get that I’m being truthful because I’m dressed in my own design. Your congruence will allow another person the opportunity to be more present with you and potentially with themselves because you’re mirroring for them. Either one or the other, whether if you’re mirroring for them then something’s off. You’re saying it will help them either to feel more aligned themselves or to feel less aligned by what they see in another person. Or to realize they are out of alignment with themselves. Yeah, exactly. For example, in your level of self-esteem you do not feel powerful. Let’s say that’s your issue. You want to feel more powerful in the world. If you were to go shopping, you would buy something that’s probably too strong for you because you feel inadequate at some level. You’re overcompensating so then everything is way too bright and too strong. Let’s take the other case where you feel, “I’m way too strong for people. I have to really tone myself down,” then you’re going to go shopping for yourself and buy something that’s way too dull. What we do is bring you in harmony and saying, “Everything is just okay the way it is.” How do you mirror that back to yourself and in turn, add harmony and balance to the universe? When you try on clothes, when you see yourself in clothes, is your instinct usually the right instinct or is it usually that it’s not necessarily that accurate? I know this is strange because it looks like I’m looking at a visual, but for me I train myself to look from the inside out. Usually, when we put something on, we’re reacting. What I’ve trained people to do is respond. You might say, “Does this collar mirror my jaw line? Does this color enhance me? Does it make me look alive?” You ask yourself these questions because we’re like, “I want to be comfortable and I want what’s on sale.” That’s our criteria. We have to come at it from a different place, a different level of intelligence, which is “Does this color make me look alive? Does the shape of this collar mirror my face?” I’m looking at your watch. If you said to me, “I need a new watch.” I would say, “Buy an oval or rectangular watch like the pendant you have on.” You have a rectangular pendant on and that’s matching the length of your face. Long equals long. I’m asked about that pendant so often over the last eight, nine years. Anywhere in the world that I’ve been, people have asked about that. They’ve inquired. You use the word inform, which is in the word information. To be informed is so important so that you can respond versus react. I love this amazing book, The Presence Process by Michael Brown. It’s a beautiful book. Among other distinctions and things that are really informative in that book is where we react versus respond, where we’re in reaction and what that is that’s producing reaction or in contrast to that. Is it a representation of my true self? Those words get tossed around. Those terms are used and people don’t often know exactly what that is. What does it look like to be in my true self? The only thing I’ve come up with is that when we’re caring for ourselves, when we are giving ourselves unconditional self-care, unconditional attention, that’s an act of self-love. In that moment, what does self-love and self-care look like in terms of the clothing that we adorn ourselves with, or the colors of the environment that we are in? The thing that I would like folks to take away among every other amazing thing that you said is the intentionality piece, that idea that this is an intention. It’s not a lucky group of people that get it, like rich people get to have it but poor people don’t or people that somehow have more education or more advantages get to have that and others don’t. This is a very level playing field. It is being informed about something that we are otherwise uninformed about. This is a part of that journey of discovery and being curious and not just settling for what is or what’s been shared with us or modeled by our parents or peers or what have you. Bringing your home to yourself instead of following the image or the dictates of other people or how it should be or even what’s appropriate. What’s appropriate is you. Owning your own self. Or the media or what we are marketed since the time that we’re so very young that this is what beauty is supposed to look like. This is what a woman is supposed to look like or a man is supposed to look like or what success looks like or whatever. It’s a very personal inquiry. I would love it for people to be able to find out more about you so that they can inquire in themselves and have assistance to do it, because this is your gift, this is your special contribution. It seems like it became your dharma to do this but in the best way. It’s not a “duty” but a privilege to do it. My website is JenniferButlerColor.com and there’s so much free information. There is a place on there where you can actually take a quiz. There is this free slideshow with music to work out your season. Obviously, we have people that come in from all over the world to work with me privately. We have amazing classes. Then we’ve developed this online program, which is the 7 Principles of Design. The book is Reinventing Your Style. What it does is it takes pictures from Mother Nature and the seven principles give you these tools of how to dress as yourself. There is an exercise on how much texture you can wear and how much design and proportion and scale and all of these wonderful things that you and I would recognize in great works of art. Now we get to apply them to us. Also, we have the True Beauty Movement. I have an affirmation card and it says, “In my life, getting dressed is a spiritual experience because I believe that my presentation is an extension of my soul. Here are ten principles I live by. I invite you to embrace them and make them your own”. That’s on the website as well. It’s really about a declaration of self. When I saw the website I thought these are incredible resources. Those that could work with you and would love to either work with you privately or to attend a class or just take advantage of those resources that are right there that are for anybody and such a generous offering. Jennifer, thank you again. Is there a ritual or a practice, one thing that sustains you? Because, of course, you’re a human being and like every other human being, you have your challenges and you have your moments of whatever those moments look like. I would say definitely the meditation for me, which is daily, and then I also do Kundalini yoga. I love it because we get up and we dance and we yell. It’s just such a good combination. The breathing, it really lets me let go of things and begin my day newly and really have my connection with the divine and with spirit that I just cherish and which is fundamental to my life. I would say the mediation and the yoga. This is my 70th year on the planet. I feel even younger and younger in spirit because I know the spirit is eternal within me. That’s really what I want to pass on. It only gets better and better. I just appreciate you and the book you’ve written. It’s definitely changed my life. I’m looking forward to meeting you in person and doing one of your courses as well. I’m looking forward to collaborating. The wheels in my brain are already spinning and thinking how many of our students, how many of the people that we are working with would benefit from what you are informing people about. This is so beautiful. Jennifer, you’ve been a magnificent person to have on our podcast. Thank you so much for just who you are. Thank you for who you are and for the invitation. I really appreciate it. This is definitely a spectacular podcast. It’s just opening up a whole other vista for how it is that you can care for yourself and be the recipient of self-love, which then produces self-trust and to walk in the world with full trust in yourself and trust in spirit, to be in spirit. We’re all divine. In your 70th year, you are out picturing quite a spirit, so what a blessing. Whatever is going on, you make a choice in that moment to love yourself fully. You all have a beautiful, amazing rest of your day wherever you are. We’ll see you very soon. If you haven’t yet subscribed to the Conscious PIVOT Podcast so you can hear all the episodes, go ahead and subscribe. If you are a pivoter, you’re making some changes and maybe some changes are around you and you don’t know quite what to do with them, then join our community on Facebook, Start My PIVOT Community. There are so many people just like you who are reinventing things in their life or pivoting or being very courageous and very vulnerable. There’s incredible support for you in the Start My PIVOT Community. We’ll see you very, very soon.